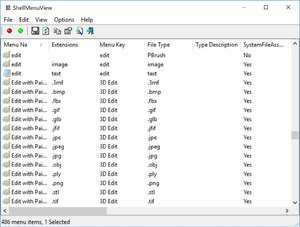 ShellMenuView is a small and simple utility to modify the Windows shell context menu; in other words, edit what you actions appear when you right click an item in Windows Explorer. As a portable application, there is no installation require which enables you to run this program from virtually any location including a USB drive. In terms of the user layout of ShellMenuView, it couldn't be easier to understand for a software application falling in this category. A list of items fetched from the Windows Registry will be displayed, giving you the option to edit the items; just right-click what you'd like to modify and you can use ShellMenuView to disable it, enable it, open it up in regedit, save, copy and more. Version 1.40 is a freeware program which does not have restrictions and it's free so it doesn't cost anything. For security reasons, you should also check out the ShellMenuView download at LO4D.com which includes virus and malware tests. Additional screenshots of this application download may be available, too.